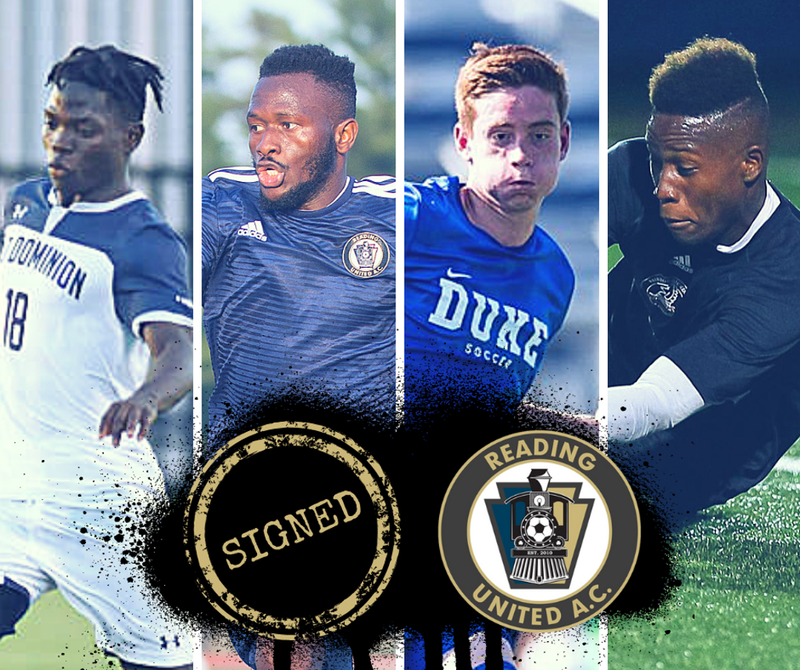 READING, PA (April 11, 2019) – Reading United will be adding four more Philadelphia Union Academy alumni to their 2019 roster, bringing Daniel Bloyou, Mo Conde, Seth Kuhn, and Jahmali Waite on board, pending league approval. All four players are graduates of YSC Academy in Wayne, PA, an affiliate of Philadelphia Union. The former Academy standouts bolster a Reading squad that will look to build upon a successful 2018 campaign that saw the club win the PDL Eastern Conference title and advance to the PDL Championship. Bloyou, a freshman at Old Dominion, is the first Union Academy graduate to commit to the Norfolk, VA based university. The Liberian-raised forward played in 17 games for the Monarchs, taking 13 shots. Bloyou played alongside United alums Mertcan Akar and Sebastian Hauret at Old Dominion, as part of a squad that finished 11-5-2 and advanced to the C-USA Tournament Semifinal. He originally joined the Union U14s in 2014, collecting 27 goals in 54 games in DA play. Conde will be returning for his fourth season with Reading United. The versatile winger has featured in 18 regular season games over the past three seasons with Reading, showing off his ability to play on the wing as both a midfielder and defender. The Philadelphia-native has spent time with University of Mobile and more recently with Florida International University, where he has totalled 16 appearances in two seasons with the Panthers. Wyomissing, PA native Seth Kuhn will be staying close to home in Berks County this summer, donning Reading’s blue and gold for the first time in 2019. Kuhn has a decorated youth career, being called into both U15 and U17 U.S. National Team camps and seeing time with USL Championship side Bethlehem Steel when part of Union Academy. This past collegiate season with Duke, Kuhn saw time in 18 of the Blue Devils’ 20 games, starting seven. Kuhn has transferred to Penn State ahead of his sophomore season in fall of 2019. Waite emerged as Fairleigh Dickinson’s primary backstop during his sophomore campaign, earning All-NEC First Team accolades for his efforts. Waite led the NEC in goals against average (0.88) and was tied for first in shutouts with five. The Philadelphia native also ranked second in save percentage (.791) and fifth in total saves with 53. Reading United’s season kicks off with a U.S. Open Cup First Round matchup against NPSL-side Philadelphia Lone Star on May 8th at 7:00pm, hosted by Alvernia University. The first USL League Two home match-up will be over two weeks later, as the Blue and Gold take the field against F.A. Euro on May 25th at Wilson High School. Season tickets are on sale at readingunitedac.com/tickets.